The semester is drawing to a close, yet the Quebec student strike is continuing (at this time) after broken-off negotiations, and this very important General Assembly is needed to determine what the GSA will do next. 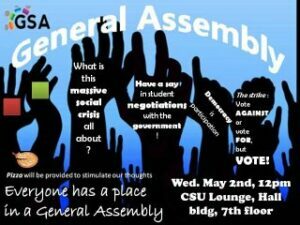 Whether or not you have been affected by the strike, and whatever your views are, the General Assembly is open to all members and structured in a way that strives for civil debate and open discussion for everyone present. Participation is important: the General Assembly is the highest decision-making body of the GSA and one in which every member has an equal voice and an equal opportunity to bring forward and argue for propositions. This is a very common and longstanding practice in Quebec student associations and is in part responsible for the province’s exceptionally dynamic, engaged and well-informed student culture. We’ll also have a celebration of the seventh General Assembly of the semester, by far the most the GSA has ever held! A pizza lunch will be served at the close of the meeting for those who attended. So WHY come to the GA? it’s your right as a member of the association! Why come to THIS GA? Any member of the General Assembly can propose to modify the agenda once the meeting has begun.